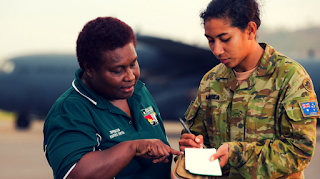 At only 23 years of age, Papua New Guinea-born Private Laurelliza Morea has already achieved one of her long-held goals since joining the Australian Army. Normally PTE Morea assists in maintaining communications equipment for a Signals Regiment. However her language skills were put to good use for Operation Hannah, the Australian Defence Force’s (ADF) contribution to the 2017 Papua New Guinea national elections. PTE Morea was sent back to her homeland to work as a translator, helping to overcome language barriers. "I was so happy I was able to go back, I've always wanted to do this job,” she said. Operation Hannah formed part of the DFAT-led, whole of Australian Government effort to support Papua New Guinea’s national election process. Around 200 ADF personnel were deployed, along with Australian Army MRH90 helicopters and Royal Australian Air Force C-130J Hercules, B300 King Airs and C-27J Spartan aircraft. The Task Group helped deliver 100 thousand pounds of election materials and transport approximately 200 PNG security personnel around the country. PTE Morea grew up in PNG before moving to Brisbane at age 12 with her parents. Operation Hannah was her first deployment with the ADF and her linguistic skills were regularly drawn upon, including translating safety briefings to Papua New Guinea Defence Force security personnel before they boarded Australian Army MRH90 helicopters for deployment across the country. PTE Morea said the deployment was the highlight of her career, since joining the Australian Army in 2014. The former Wavell State High School student is a keen sports enthusiast, playing volleyball, touch football and rugby union for ADF sporting teams.